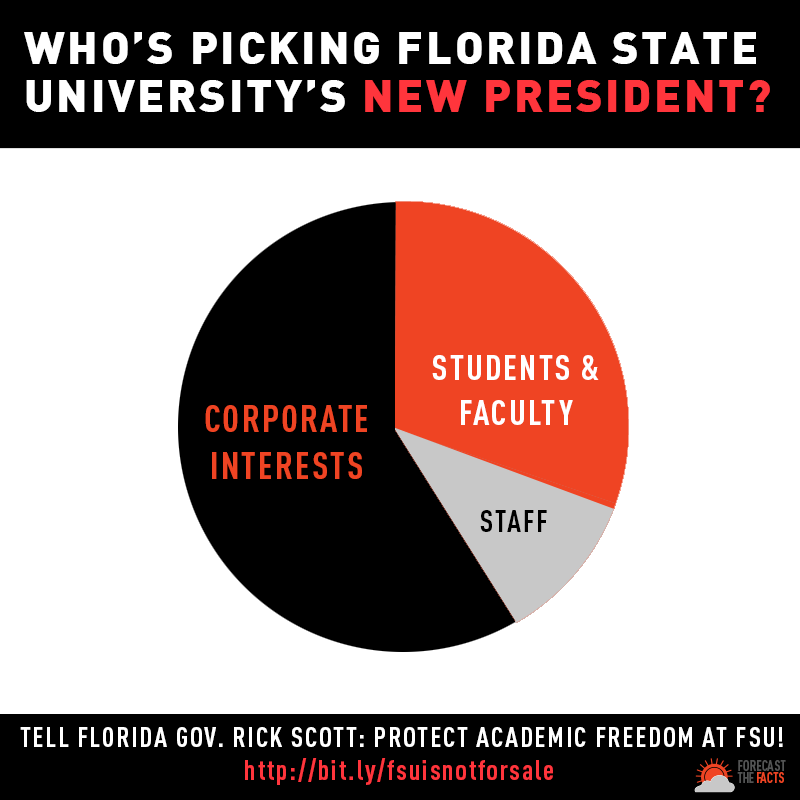 FSU’s next president should be selected with academic integrity — not hand-picked by corporate interests. Stop undue corporate influence in FSU’s presidential search. It’s a make-or-break moment for academic freedom at FSU. Right now, FSU is searching for its next president — but the search process is controlled by corporate and political interests, many of which have ties to the American Legislative Exchange Council (ALEC) and the Koch brothers. Worse yet, the person chosen as president will have the power to approve or reject contracts — such as the multimillion dollar contracts FSU signed with the Charles G. Koch Foundation in 2013, which gave the Kochs undue influence over hiring of staff and the curriculum. The Presidential Search Advisory Committee (PSAC) meets on September 5th to begin the selection process. Let's put the national spotlight on FSU right now — and together we can stop this corporate takeover. Tell Florida Governor Rick Scott and Board of Trustees Chair Allan Bense: Protect academic freedom. End the corporate majority in FSU’s presidential search. © 2014-. Some rights reserved.